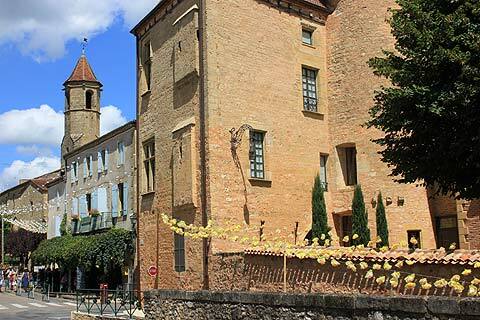 Belves is a lovely and lively medieval town, with a typical bastide layout and centre, and a preserved 15th century covered market hall. The town is well worth a visit. In the centre of the town you can visit some troglodyte dwellings that date from around the 13th century. In the town you can also see the medieval belfry and walls, a 14th century castle, and the city hall. 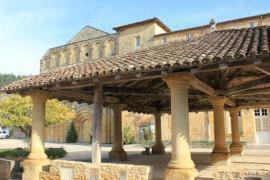 Belves is famous as being the 'town of seven bell towers'. 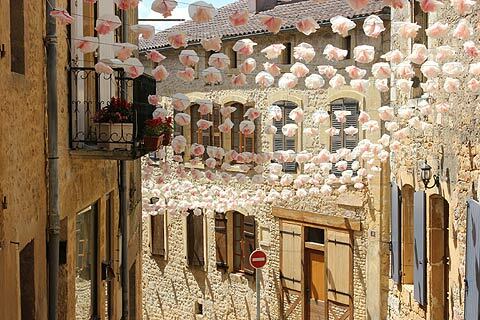 You will enjoy a pleasant afternoon wandering the streets and alleys of Belves - note that it is listed as 'one of the "most beautiful villages" in France' and deservedly so - it really is very charming. 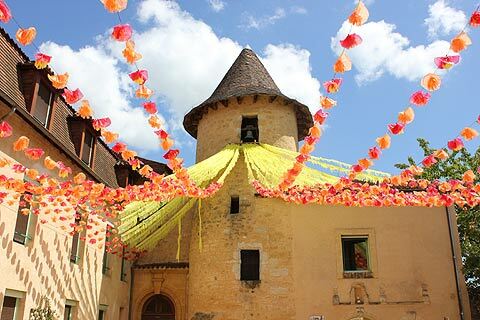 The old town, called Le Castrum, originates from the 11/12th century and was originally surrounded by ramparts. 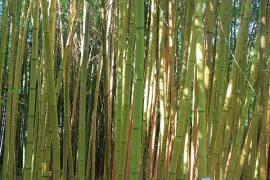 These were 15 metres high under the hospital! Some of the ramparts are still visible - wander down the rue du Petit Sol and the rue de l'oiseau qui chante (street of the bird that sings!). The Belfry was built in the 11th century and was originally a defensive tower overhanging a deep moat in which people lived in caves. At the bottom of the moat the troglodytes grew their vegetables. 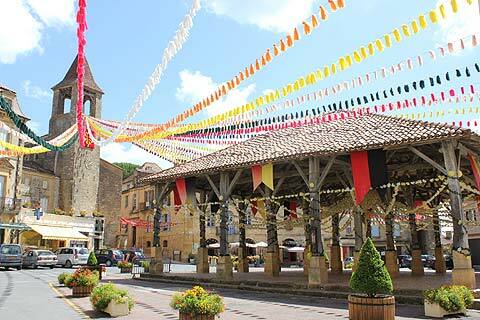 Rather amazingly there are a number of troglodyte (cave) dwellings situated right underneath the main square of Belves. 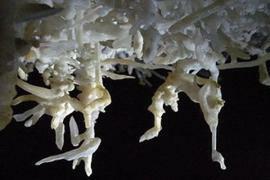 These can be visited and a visit to the "Habitations troglodytiques" is fascinating and not to be missed. The entrance to the troglodyte dwelling is by the fortified gate in the corner of the square. In the 11th century the fortified gate had a drawbridge and was the only entrance to the Castrum. Also from the 11th century is the 'Tour de l'Auditeur'. The entrance is high up as guards used to enter by ladder and then pull this up to prevent intruders. The other main building of the middle ages is 'La Tour du Guet', the watch tower which is out of town on the corner of the rue du Bout du Monde (End of the World Street ) and the Pelevade street (named after a menhir which once stood here). The watch tower overlooks the valley and so could warn when the enemy approached. Take a look also at the Hotel Bontemps which is a 12th century building which had a facelift in 1520 and now has an Italien Renaissance facade! It is named after an Englishman, Thomas Bontemps who lived there during the Hundred Years War. 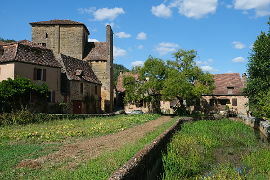 Moving into the 13th century there is the monastery of the 'Freres Precheurs', now the townhall of Belves, and the church of Moncuq whose choir and chapels are 13th century though much of the rest is 15th century. 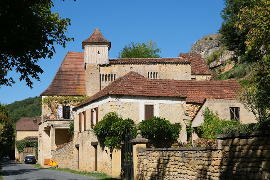 The chateau on the edge of town was started in the 14th century and altered during the Renaissance and afterwards. In the 15th and 16th century the covered market was built. Note the pilori chain on one of the pillars. This was put round the neck of wrong-doers and they were held there for two or three days. 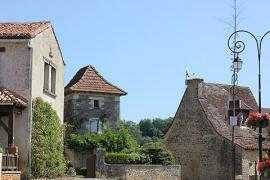 The Maison des Consuls which houses the tourist office is also 15th century and was for meetings of the consellors. The ground floor was a guard-room. If you are holidaying with children then the outdoor pool in the centre of Belves is a great way to keep the kids entertained. Market day in Belves is Saturday morning and during July and August there is an evening market on Wednesday nights where you sit down at one of the tables laid out around the central halle and then select what you will eat from the surrounding stalls. Its a fun, affordable and tasty way to eat out during the summer. 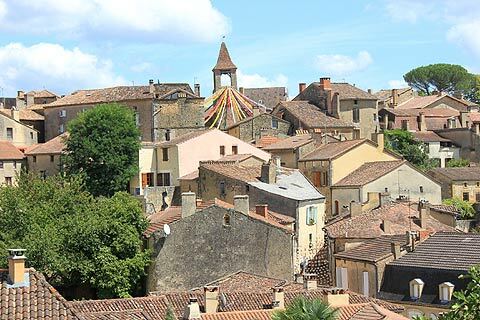 One of the highlights of Belves is its position on a rock outcrop, overhanging the valley of the river Nauze, and the views across open countryside from the town. Don't ignore the surrounding countryside wnen you visit Belves - there is a great deal to explore in the surrounding small villages. 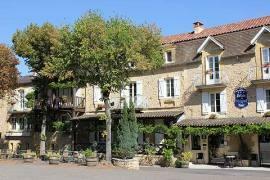 When we visit different areas of France we always look out for the "plus beaux villages"/ "most beautiful villages" in the area. They really are such a treat. 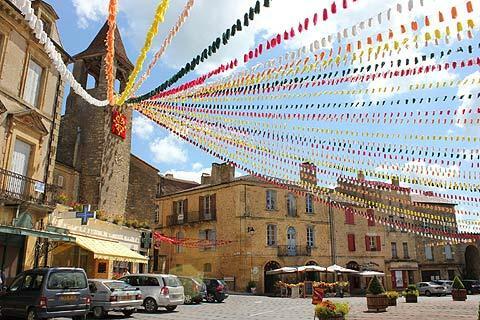 Near to Belves Monpazier is another such village and is amongst the best of them. 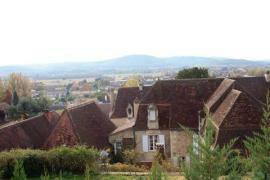 The tiny village of Urval is not far away and is very charming. Its church has a wonderful sculpted doorway.